Bayerische Motor Works (more commonly known as BMW) were certainly onto a winner when they came up with the “even Stephens”: in other words, the even numbers to fill the gaps between the 3, 5 and 7 that we’ve known and loved since BMW cars were THE status symbol of the 1980s. With the new BMW 2 Coupé, the German super-marque has continued in this fine tradition, producing a small but very stylish set of wheels. Of the three body styles available in the current 2-series lineup, the BMW 2 Coupé is probably the most conservative (the other two options for late 2015 are a convertible and the Active Tourer. Conservative is, of course, a relative term. There is nothing bland at all about the BMW 2 Coupé. It’s simply the body style that’s likely to have the widest appeal for the majority of drivers. As usual, BMW have come up trumps with the styling. Naturally, we’d expect a marque with this sort of history to come up with something good and it has. The styling isn’t in-your-face swank; instead, it plays around with lots of little details: things like the shark-fin aerial for the Bluetooth/smartphone connectivity and the semi-retro strip-styled tail lights. Two variants are available for the BMW 2 Coupé: the M Sport and the Sport. Of the two, the M-Sport is the tiniest bit more in-your-face and aggressive in its styling, mostly thanks to the classic M-Sport body kit. 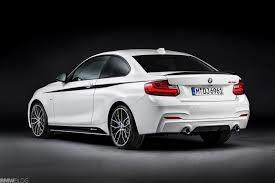 However, unlike some small sporty cars, the BMW 2 Coupé isn’t curvaceous. It has aerodynamics in the right places but it’s more… well, masculine, is probably the best word. If the BMW 2 Coupé was turned into a cartoon character, it wouldn’t be personified as a stylish female (think Sally the Porsche in the firs Cars movie). Instead, the BMW 2 Coupé would be the smart, sophisticated hero who’s not over-muscled but can kick the villains’ butts when required – more Orlando Bloom or Benedict Cumberpatch than Arnold Schwarzenegger or The Rock. Four possibilities are available for the engines: the M235i for the M-Sport (petrol), of course, and the 220i (petrol), the 228i (petrol) and the 220d (diesel). Each of these comes coupled to 8-speed automatic gearing. The M-sport unit is by far the highest performer (as you would expect when comparing a six-cylinder with 2.9 L capacity against four-cylinder units with 2.0 L), with 240 kW of power and 450 Nm of torque. Of the others, the one with the most power is the 228i (180 kW as opposed to the 220i’s 135 kW and the 220d’s 140 kW), the one with the most torque is, unsurprisingly, the 220d (400 Nm rather than the 228i’s 350 Nm and the 220i’s 270 Nm). All four units in the BMW 2 Coupé lineup can do the 0–100 km/h sprint in well under 10 seconds, with the slowest time for this feat being 7.0 seconds for the 220i and 220d. In the fuel consumption department (and bearing in mind that these figures were derived on a test track in a lab rather than in real-world conditions), the most frugal is the 220d, with a combined figure of 4.1 L/100 km. Second place goes to the 220i (6.0 L/100 km), third to the 228i (6.3 L/100 km) and last place to the M-Sport (7.6 L/100 km). No matter what engine you prefer, the BMW 2 Coupé has been set up to maximize handling. Rear-wheel drive, 50-50 weight distribution, launch control and DEC all play their role. DEC (Driving Experience Control) allows the driver to select the driving style that suits you best: Eco Pro, Comfort and Sport. Naturally, it’s got a stability control package with the works (cornering brake control, ABS, brake assist and traction control). Alongside all the usual features for handling and performance, which are ultimately variants of what was seen on the old 1980s BMWs, you’ll find all the sensors and feedback loops that characterise vehicles of the late twenty-teens (or whatever you call the current decade). Take the Eco Pro drive setting, for example. This doesn’t just modify things so that you can save fuel. If you have the Navigation Pro package (M-Sport only), it will give you heaps of tips to help you save even more fuel, such as those available through the Route-Ahead Assistant. This doesn’t just tell you when corners and speed limit changes are coming up so that you can adjust gradually (the best way to save on fuel); it also monitors road conditions and suggests routes where you can dodge the heavy traffic. It’s jaw-dropping. The BMW 2 Coupé has all the usual driver aids such as cruise control and rear parking assistance; it’s also got rain sensors with automatic headlights, the ability to personalise all the important controls and save your settings, air conditioning with automatic everything and then some! You’ve also got the ability to limit your own speed – setting the maximum so you don’t accidentally creep over the legal limit. Cops are getting tougher, so this feature is pretty high on the desirability list for a lot of drivers and it’s a pity you can’t retro-fit them. Another system that works in with the infotainment system is the Intelligent Emergency Call system. If it all turns to custard in spite of all the active and passive safety features, it will transmit information about your crash to a call centre, which, in turn will notify emergency services. There’s a manual “SOS button” too. Smart, smooth, sporty and sophisticated… what’s not to love about the BMW 2 Coupé? For any more information on the BMW 2 Coupé, or for that matter any other new car, contact one of our friendly consultants on 1300 303 181. If you’d like some fleet discount pricing (yes even for private buyers! ), we can submit vehicle quote requests out to our national network of BMW dealers and come back with pricing within 24 hours. Private Fleet – car buying made easy!